Janet Biggs’ video, Point of No Return focuses on individuals in the face of cultural loss or change. To many, cultural extinction is a part of human evolution. Whether through assimilation, globalization, technological advancement, or battle, cultures expand and disappear. Filmed in the Taklamakan desert and the livestock market of Kashgar, Biggs documents the rigors of survival for man and beast. Point of No Return examines the loss of a sense of self and way of life in one of the world’s most isolating and harsh location, known as the “Desert of Death”. Xinjiang, the western extreme of China, is also referred to as the Uyghur Autonomous Region. Uyghurs, originally a Turkic tribe of nomadic herders, became masters of the region in the tenth century, controlling the trade along the northern arm of the Silk Road. In present day Xinjiang, the Chinese government fears unrest and a possible Muslim stronghold as Uyghur’s seek autonomy. The central government has imposed strict regulation on the Uyghurs, including destroying much of their traditional homes and ways of life. 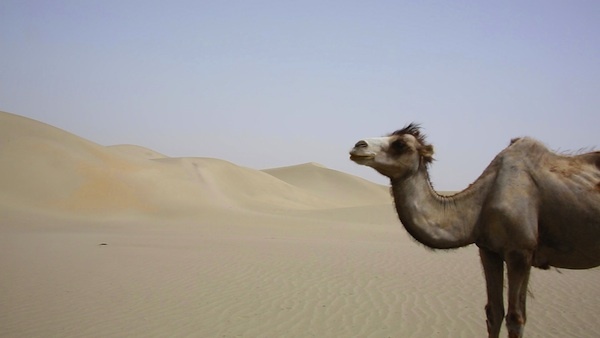 Biggs traveled into the Taklamakan desert with eight camels and their Uyghur handlers. She filmed the caravan as it journeyed past ancient sites, some in ruins, others buried under the desert. Set against backgrounds of fevered market activity and never-ending oceans of dunes, Point of No Return reveals the grit, endurance, and desire for a way of life at risk of vanishing into the sands by choices self-made or externally imposed.